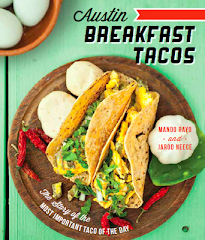 Taco Journalism: This is our Taco Manifesto! That's right, we have a Taco Manifesto. We're trying to make tacos the official food of Texas not only cuz we love them but to honor and recognize the contributions of abuelas, mamás, tortilleras & taqueros that have been nourishing our bellies waaaay before Texas was Texas. So ladies and gentle folk, cowboys y vaqueros, this is our Taco Manifesto! Whether you grew up here in Texas or got here as soon as you could, chances are, you’re eating tacos. In Texas, people eat tacos on a weekly basis, and to be honest, tacos have been trending since the 1800’s. 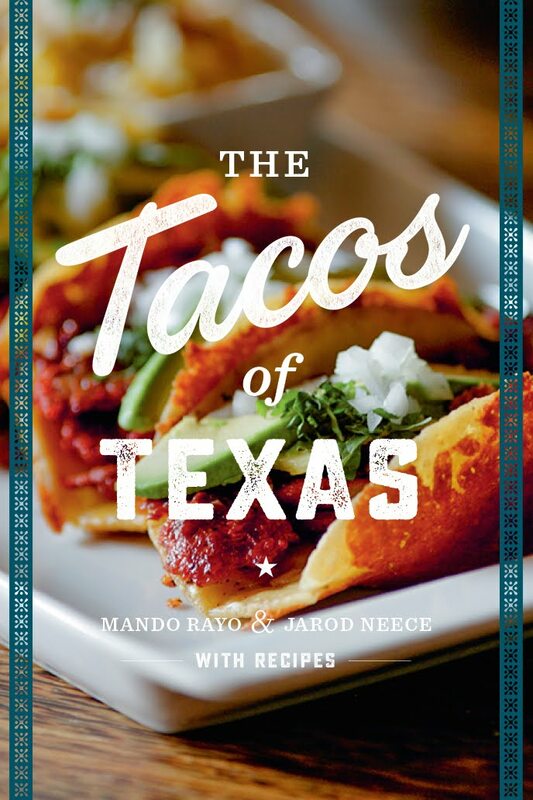 Rooted in Texas’ food culture, tacos are enjoyed all across the Lonestar State. In Texas, you can find tacos almost anywhere, not just at Mexican or Tex-Mex restaurants but food trucks, trailers, gas stations, restaurants of every culinary variety, barbecue joints, and even the classic All-American diner. 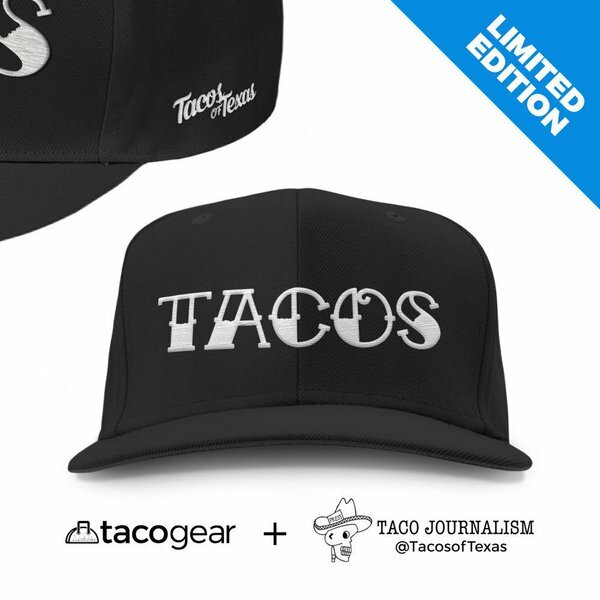 For many, tacos are a part of their daily diet and people in Texas are die-hard taco fans. Whether it's debating the origins of the breakfast taco, contemplating who makes the best brisket taco, or showing our love for the traditional recipes like al-pastor, carnitas, or fajitas; we Texans are passionate about our tacos. Tacos have brought people together to the table to discuss the important policy issues that we have to face. They help small business owners put their kids through school and strengthen our economy. They start many people’s days with a full stomach, nourished, ready to face the day and help make Texas the best place to live in the world. (Not to mention eating them for lunch and dinner as well.) They come in every variety, from eggs and bacon to brisket, al pastor, bhan mi y más. 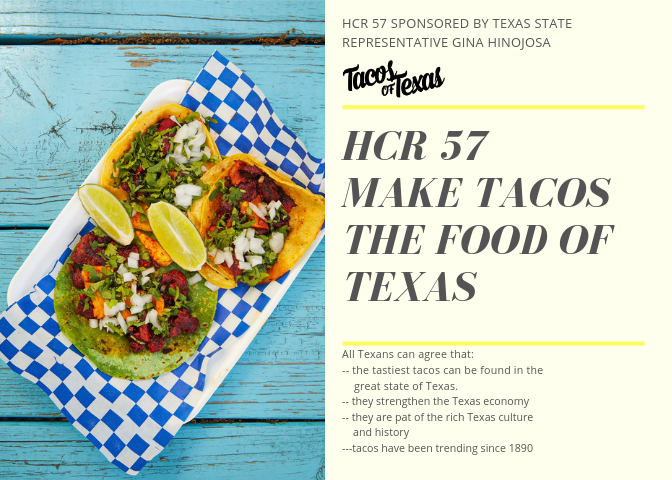 In closing, we’re asking the people of Texas to add tacos to the menu along with current dishes and foods that are already recognized including Chili, Grapefruit, Jalapeños & chips & salsa. And doing so will make your abuela proud! 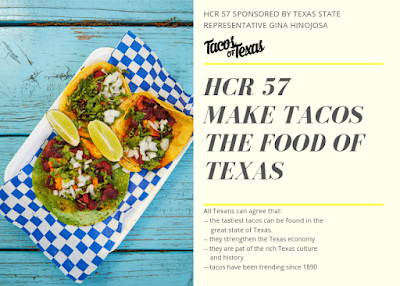 If you believe in our Taco Manifesto, I urge you to sign our petition here and contact your Texas State representatives (details in the petition page).